A bottle ecosystem is an excellent way to study how populations of plants and animals interact (for example, in the carbon cycle). They are simple to build and are excellent for class projects and science fairs. We'll start with the simplest one to build, the aquatic ecosystem. We recommend a 2 or 3 liter bottle (an empty soda bottle works fine). You can use smaller bottles but they aren't large enough for fish. Glass also works but can break if dropped. It is easiest to get plants, fish, and snails from an aquarium store, usually under $5 for everything. You could also try getting materials from a local pond. Tell them you're doing a project on bottle ecosystem and they should be very helpful. Plants: Elodea/Anacharis (usually $3 a bunch). Often there is a metal clip holding the plants together. You can use this to make the plants sink to the bottom if you like. Fish (optional): One feeder guppy (under $1). 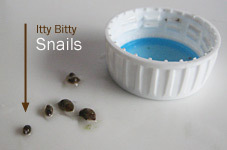 Snails: Ask for two or three of the small snails that come with plants. They shouldn't charge you for these. You don't really want large snails. You might not find a fish for your ecosystem easily. If you do, make sure it is small (about ½-1 inch). A very small crayfish will also work. Snails will likely be found on rocks near shore or on decaying leaves. You only need two or three. Remember that you are taking organisms from a living ecosystem to put in your ecosystem. Only take what you need and try not to disturb the area. Try to get a bit of decaying leaves if they are there. You don't need much but it will have numerous microorganisms. Water: We recommend you bring your two liter bottle to the aquarium or pond to get water. This way you'll get the all of the microorganisms present in the ecosystem. If you do use tap water, it must sit in an open container for 24 hours before you use it. Otherwise the chlorine in the water will kill the fish, snails, and microorganisms in your ecosystem. Wherever you get your water, make sure it has come to room temperature before adding organisms. Rocks: In order to make your model ecosystem closer to the earth ecosystem, you should add small rocks or gravel first (wash it to remove any contaminants before putting in your ecosystem). Detritus: This is really just dead plant matter. You only want a little bit, perhaps one leaf to provide food for microorganisms. The fish and snails will use these microorganisms for food. Too much plant matter can cause your system to crash due to lack of oxygen (a process called eutrophication). Important: using water directly from the sink will kill the snails and fish. Tap water has chlorine, an invisible gas used to make the water safe to drink. If you set the water out for 24 hours the chlorine gas will leave and the water will be safe for the fish and snails. Fill the bottle about 3/4 of the way to the top with water. If you use tap water, let it sit for 24 hours to dechlorinate. Add the rocks (about 1 to 2 inches worth) and perhaps a dead leaf. Add the plants. Be sure to separate the strands if they came clipped together. They may float, that's okay. 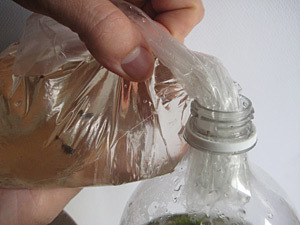 Read our guide on how to get the fish safely into the bottle. Then add the fish. You only want one fish for your ecosystem. Let the ecosystem settle in for 24 hours before putting the top on the bottle. that gets direct sunlight for a few hours every day. that won't be knocked over or disturbed by people or pets. that you can observe easily. If your ecosystem doesn't contain a fish, it can be kept in a window area that does not get direct sunlight (although some direct sunlight is best).